AE Smith Building Technologies is using systems technology in new ways to deliver energy savings for some of Victoria’s most high profile public venues. Taking Building Management Systems (BMS) typically used on air conditioning plants, Building Technologies have expanded the technology and aim to apply it across Flemington Racecourse’s extensive refrigeration systems. Energy Saving Refrigeration Systems installed across a multitude of different cool rooms at the home of Victorian racing is designed to provide proactive maintenance solutions as well as cost savings. “One of the benefits of this intelligent system we’ve developed is that the controls can supervise as many devices as needed, collect information and look for problems – and publish all this in real time,” says AE Smith Building Technologies Business Development Manager, Brad Disher. It’s this real time problem detection that’s become an important adaptation of the BMS technology for a site such as Flemington Racecourse. 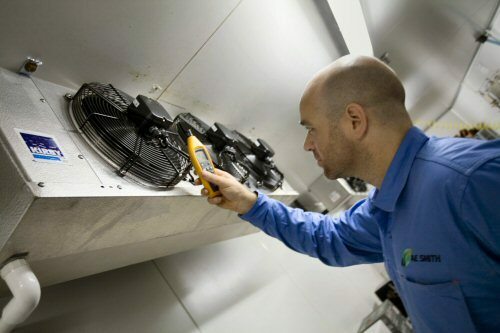 The Energy Saving Refrigeration Systems also provides cost savings by detecting condition based maintenance – letting customers know when and what service might be required pre-emptively rather than sticking to a strict maintenance schedule. “The systems mean servicing and maintenance can occur on an as needs basis,” adds Brad. And while this latest adaptation of technology has been applied to a large-scale public venue, the principles of cost savings, problem detection, reporting and energy reductions hold true to smaller sites and buildings. “The Energy Saving Refrigeration System is definitely applicable across sites of smaller sizes and different industry sectors,” adds Brad.